The number of Pacific salmon has declined dramatically. But the loss of genetic diversity may be a bigger problem. Over the last several decades, people living in the Pacific Northwest have seen dwindling numbers of salmonid fishes (which include five species of salmon and two of trout) in local rivers and streams. Much of the loss can be attributed to the destruction of habitat as the region becomes more developed. Some of the blame can also be placed on the inadequate regulation of fishing. The resulting problems go beyond the obvious decline in numbers: The genetic diversity in these fish is also being eroded. Strategies to restore Pacific salmonids to a healthy state will need to ensure that adequate biodiversity is maintained. Each year, countless salmon migrate from the rivers and streams along the western coasts of Canada and the U.S. to the Pacific, while at the same time others leave the ocean and return to freshwater to spawn a new generation. This ritual has been going on for many millennia. But more than a century ago, the number of salmon returning from the sea began to fall dramatically in the Pacific Northwest. The decline accelerated in the 1970s, and by the 1990s the U.S. Endangered Species Act listed 26 kinds of salmon as endangered or threatened. Were those worries overblown? Not at all. Pacific salmon have now been extirpated from nearly 40 percent of their historical habitat in the Pacific Northwest. Nearly half the remaining populations are at risk of extinction. The threats to salmon span almost every major freshwater ecosystem from the Los Angeles River to Canada. The crisis has made the unthinkable seem all too possible: a Pacific Northwest without salmon. Unlike any other endangered species, salmon affect nearly everyone in the Pacific Northwest, either directly or indirectly. Indeed, this fish has long been the quintessential symbol of life there. Salmon provided the basis for the earliest cultures, economies and religions of indigenous peoples, and even after settlers arrived, treaties assured Native Americans access to salmon on their historic fishing grounds. In the past, activities related to fishing generated about one billion dollars in personal income annunally and provided as many as 60,000 jobs. The situation is now much more bleak, because millions of people—nearly every resident of the Pacific Northwest—compete with salmon for the waters in which the fish spawn and migrate: Dams, irrigation, mining, logging and cattle grazing all act to destroy salmon habitat. With so many people affected, proposals for protecting salmon are highly contentious. All parties agree that conservation measures should be driven by science, but scientific opinion about how to help salmon recover is itself splintered. Although the root causes of the problem have long been well documented, investigators are just now beginning to understand that human activities have selectively eliminated some populations of salmon while favoring others, resulting in the loss of much of the genetic heritage in these amazing animals. Curiously, such changes have received far less attention than has the dwindling number of fish. For example, in 1996 the National Research Council published a definitive 450-page treatise on the salmon crisis, and that tome discussed the genetic effects of human activities in fewer than five pages. So here we try to show the risks confronting salmon populations and salmon biodiversity with a focus on the potential for genetic loss. To appreciate the issues requires first a basic understanding of salmon biology. The life cycle of a typical salmon begins with females depositing eggs in nests, or redds, on the gravel bottoms of rivers and lakes. The young emerge from the redds and live in freshwater for periods ranging from a few days to several years. Then the juveniles undergo a physiological metamorphosis (called smoltification) and head toward the ocean. Once in the sea, the salmon often undertake extensive migrations of thousands of miles while they mature. After anywhere from a few months to a few years, adult salmon return—with high fidelity—to the river where they were born. There, they spawn and the cycle begins again. The true biological diversity of all the salmonids, however, is revealed only below the species level. Specialists have, for example, identified two kinds of chinook salmon—known as stream-type chinook and ocean-type chinook—that display significant differences in the age at which they move to the sea, in what patterns of ocean migration they follow and in when they spawn. Stream-type chinook spend one or more years in freshwater before heading to sea; they also undertake extensive offshore voyages and return to their natal streams during the spring or summer, often holding in freshwater for several months before spawning. In contrast, ocean-type chinook move out very early in life, before they reach one year of age. But once these salmon reach open water, they do not travel far offshore. They usually spend their entire ocean residence on the continental shelf and return to their natal streams immediately before spawning. Interestingly, the divisions among chinook salmon do not stop with these two groups. Within both categories there is tremendous variability in the timing of and age at spawning. For example, ocean-type chinook return to the Columbia River only during the summer and fall. Ocean-type chinook from the Sacramento River, however, return during every season of the year. Such differences motivated a formal classification of the salmonids in the lower 48 states that goes beyond the traditional Linnean system to define groups of populations as evolutionarily significant units, or ESUs. In all, between 50 and 55 salmonid ESUs inhabit the waterways of the American West. Because salmon typically return to reproduce in the river where they were spawned, individual streams are home to local breeding populations that can have a unique genetic signature. Chinook in the coastal streams of Washington, for example, are genetically distinct from those of Oregon. And even within the Columbia River basin, clear genetic differences are evident. Stream- and ocean-type chinook within the Columbia watershed can be differentiated, as can stream-type populations from the upper and lower reaches of the river. Yet it would be a mistake to believe that genes control all the differences between these fish. Take, for example, the age of maturation, which the two of us have studied recently. The chinook that reproduce at high elevations tend to spawn at around five years of age, when their bodies are large; the chinook that use lower spawning grounds reproduce earlier in life, at around age four. Although this difference might well be genetically programmed, the state of the ocean also influences it: If food is plentiful when these fish first enter the sea, they tend to return sooner than they would otherwise. Such findings clearly demonstrate that salmon react in complex ways to natural variations in the environment. It should come as no surprise, then, that salmon populations respond differently to human-induced changes to their environment. First, consider fishing. Simply put, fishing has harmed some salmon stocks more than others. In the Columbia River Basin, for example, harvest rates for different populations of chinook varied by as much as 10-fold through the 1980s. The annual harvest rate for ocean-type chinook from the lower Columbia River, from the Snake River (fall run) and from the upper Willamette River was often more than 50 percent. By comparison, stream-type chinook from the upper Columbia (spring run) and from the Snake River (both spring and summer runs) experienced annual harvest rates below 10 percent. Why do these disparities exist? For one, ESUs migrate at different times, so depending on the timing of the river harvest, populations may be exploited to different degrees. Additionally, ocean-type chinook tend to remain near the coast, where they are more accessible to fishers, while stream-type chinook migrate far offshore, essentially out of reach. Consequently, reduction of fishing will help some ESUs but have little impact on others. According to a study by Michelle McClure and colleagues of the National Marine Fisheries Cumulative Risk Initiative, if fishing stopped completely, the annual population growth of some ocean-type stocks of chinook in the Columbia River would increase by at least 20 percent—enough to reverse their current decline toward extinction. But such a harvest moratorium would have virtually no impact on stream-type chinook. The effects of fishing on salmon, however, go far beyond simply catching more fish of one type than another. A 1981 examination of weight changes in pink salmon is particularly dramatic. William Ricker, of Canada’s Department of Fisheries and Oceans, documented a decline of more than 30 percent in the average body weight of spawning pink salmon from the 1950s onward. This long slide appears to have originated in the late 1940s, when fishers shifted from selling their goods by the piece to selling them by weight, a change that prompted the use of nets that capture only the largest fish. As it turns out, the new fishing practices exerted a selective pressure on these creatures and altered their genetic makeup. Because all pink salmon return to spawn at the same age (after their second year), the largest are those that have the fastest growth rate—a trait that is at least partially determined by genetics. Size selection by fishers gave the smaller ones a higher probability of survival, thereby favoring genes for slower growth. Another large-scale threat to salmon has been the destruction of their freshwater environment. While there is a voluminous literature on the specific habitat requirements of salmon, the general needs of these fish are really quite simple: They must have plenty of gravel in which to spawn; they need enough clean, cool water to swim, escape predators and find food; and they require sufficient vegetation along the river banks to protect the stream bed from excessive erosion or sedimentation, to add nutrients to the water and to provide woody debris as shelter from strong currents. Over the past 150 years, mining, livestock grazing, timber harvesting, agriculture as well as recreational and urban development have eliminated or substantially disturbed salmon habitat. The numerical effect is obvious—there are fewer salmon in degraded regions than in pristine ones. As with fishing, however, habitat loss and destruction have the potential to reduce genetic diversity. The most obvious mechanism is the extinction of entire salmon populations. Indeed, most analysts believe that environmental degradation underlies the demise of many of the 106 salmon populations now considered extinct. Although some rivers have been subsequently recolonized, the unique genes of the original populations have been lost. Large-scale disturbances in one locale also have the potential to alter the genetic structure of populations in neighboring areas, even if their habitats are pristine. Why? Although the homing instinct of salmon to their natal stream is strong, a fraction of the fish returning from the sea (rarely more than 15 percent) stray and spawn in nearby streams. Low levels of straying are crucial: The process provides a source of novel genes and ensures that a location can be repopulated should the fish there disappear. Yet high rates of straying can be problematic, because the misdirected fish may interbreed with the existing stock, diluting any local adaptations that may be present. When environmental conditions are stable, straying rates are relatively low. But they can increase dramatically when streams suffer a severe disturbance. The 1980 eruption of Mount St. Helens, for example, damaged more than 500 square kilometers of forest and sent mud and other debris into several major tributaries of the Columbia River. For the next couple of years, steelhead returning from the sea to spawn were forced to find alternative streams. As a consequence, their rates of straying rose from 16 percent to more than 40 percent. Although no one has attempted to quantify changes in the rate of straying as a result of the disturbances people have caused, there is no reason to suspect that the effect would be qualitatively different than what was seen in the aftermath of the Mount St. Helens eruption. Such a dramatic increase in straying from damaged areas to more pristine streams results in substantial gene flow, which can in turn lower the overall fitness of subsequent generations. The extensive development of hydropower on the major rivers of the western U.S. has clearly disrupted populations of salmon. The Columbia River basin alone now contains thousands of dams (some only a meter or two in height and others more than 100 meters tall), which block off over a third of the original salmon habitat. The damaging effects of these dams vary widely: In the Columbia basin, for instance, 10 percent of the dams over 15 meters tall have fish ladders, which assist adult salmon migrating upstream to pass up and over them. Young salmon traveling downstream have also been helped across dams with bypass systems that divert the small fish away from potentially deadly turbines. In some places, barges transport juvenile salmon downriver, keeping them out of harm’s way. Yet the threat from dams is not limited to reducing the numbers of migrating fish. Again, a significant threat is to salmon biodiversity. Consider, for example, what could happen to a few salmonid species, such as sockeye salmon and steelhead trout, that have populations that never move out to sea. Dams might exert a large selective force in favor of those fish that do not migrate. For both sockeye and steelhead in the Columbia Basin, this potential may become reality. Above several dams there, the status of anadromous steelhead and sockeye is dire. In contrast, the resident steelhead and kokanee (a form of sockeye) remain relatively healthy. Should this trend persist, sedentary stocks may well come to dominate streams where anadromous forms once were prevalent. Other genetic modifications might come from the very engineering fixes made to protect these fish from harm. Dams on the Columbia and Snake Rivers are equipped with submersible screens designed to divert migrating juveniles away from turbines. Unfortunately, these measures do not benefit all fish. These screens steer as many as 95 percent of the stream-type chinook around turbines, but because of idiosyncrasies in behavior, these measures redirect as few as 15 percent of ocean-type chinook. One thus expects to see genetic shifts in favor of the stream types. Fish ladders, too, have drawbacks. Although these devices have helped to bring survival rates for mature fish closer to historic levels, dams have certainly altered their upstream journey. 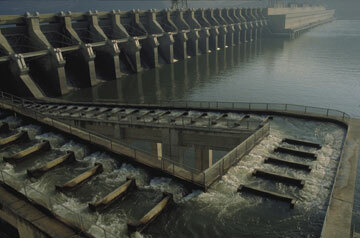 Rather than swimming against a flowing river, adults now pass through a series of reservoirs punctuated by dams, where discharge from the turbine can disorient the fish and make it hard for them to find the ladders. Such impediments do not kill the fish, but they affect migration rates and, potentially, spawning. Salmon do not feed as they swim upstream to spawn but instead rely on stored energy. The changes to their migration route clearly have the potential to impose an artificial selective force. Dams may also modify salmon habitat in more subtle ways. 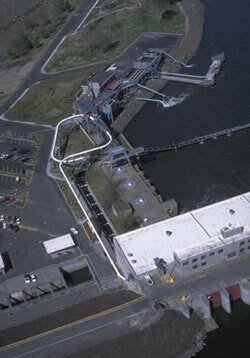 An indirect effect of the 92-meter Brownlee Dam on the Snake River provides a dramatic example. Historically, the upper Snake River produced some 25,000 to 30,000 chinook salmon that spawned during the early fall. The completion of the dam in the late 1950s not only rendered the vast majority of their habitat inaccessible, but also led to more extreme water temperatures downstream from the dam. These changes, in turn, altered the life cycle of the small population of Snake River chinook that remained. Today, young chinook emerge from the gravel later than they did before the dam was built, and thus they migrate downstream later, when temperatures are higher and water levels are lower. Hatcheries (where fry are raised from eggs) have become the foundation of efforts to preserve the salmon fishing industry—and in some cases the species themselves. Each year, facilities situated around the Pacific rim release more than six billion juvenile salmon; on the Columbia River alone, hatcheries produce about 200 million fish. [Note: Hatchery totals were incorrectly stated in the printed version.] But the benefits of all this work have yet to be demonstrated. Indeed, this program may well be a contributing factor in the long-term decline of salmon. How so? To answer that question, one needs to understand how the system operates. The raising of Pacific salmon is sometimes called “sea ranching.” Fish remain in hatcheries until they are juveniles, when they are released into the adjoining river or stream. They soon swim to the Pacific to feed on the “ocean pasture.” The salmon that survive typically return to the hatchery in which they were raised, although some do stray and spawn in the wild. The risk of changing the salmonid gene pool as a result of such practices was once thought to be minimal, because these fish typically experience natural conditions for most of their lives. Recent research, however, suggests that the artificial propagation of salmon can permanently alter genetic makeup and ultimately reduce the viability of wild populations. A 1999 review by Reginald Reisenbichler and Steve Rubin of the U.S. Geological Survey dramatically highlights this notion. They found that the survival of hatchery-raised steelhead released into a river in Oregon was about 20 percent lower than that of their wild counterparts. In a separate study, Ian Fleming and Mart Gross of the University of Toronto determined that coho bred in hatcheries tend to be less aggressive than wild coho and thus have less success spawning. The ability to avoid predators, the timing of reproduction and their degree of territoriality also vary between hatchery and wild salmon. When hatchery-raised fish stray, they can pass on their genes to others. And although the hypothesis is still the subject of much research, many studies suggest that such interbreeding between hatchery and wild fish results in offspring that are less fit to survive. Clearly, conservation managers need to rethink the traditional role of hatcheries. We anticipate that there will be a place for them. But the people who run hatcheries must focus their attention on the production of salmon that are more like their wild counterparts, and they must find other ways to minimize adverse effects on wild populations. Although the value of genetic diversity is often taken as a truism by conservation biologists, for some species the loss of variability does not necessarily increase the likelihood of extinction. The biological diversity seen in the northern elephant seal, for example, is very low; yet there is no evidence that this animal is endangered because of it. Faced with certain changes to salmon biodiversity, fisheries biologists must determine whether or not salmonids are fundamentally like elephant seals. The answer depends in large part on two factors: first, the extent to which salmon have adapted to their local environments and second, the speed with which salmon adapt (or readapt) to their surroundings. Because much of the diversity within and among Pacific salmon has at least some genetic component and because there is little gene flow among these populations, one expects to see some local differences in homing ability, disease resistance and response to stream flow, for example. The failure of most attempts to transplant stocks to a new habitat also suggests that salmonids have evolved specializations suited to particular local environments. Nevertheless, the possibility remains that some highly variable traits do not reflect genetic adaptations. This hypothesis receives far less attention than adaptationist theories, yet evolutionary biologists acknowledge that populations of any species may diverge randomly as a result of genetic drift over generations. To evaluate local adaptation (or lack thereof) among salmon, one needs some idea of how much drift has taken place. A recent survey of sockeye salmon sheds some light on this question. Jay Hensleigh and Andrew Hendry of the University of Washington explored the response of sockeye to the direction of the current. This species is particularly sensitive to flow because after emerging from the gravel river bottom, young sockeye must move to lakes where they grow. Fry born in outlet streams must migrate upstream to get to the lake; fry born in inlet streams must travel downstream. This response is genetically determined and is usually under strong selection pressure, because fish that migrate in the wrong direction will die. Remarkably, however, some sockeye spawn on the beaches of lakes. Because these fish do not need to travel upstream or downstream, there is no selective pressure for this behavior. Hensleigh and Hendry tested the response to stream flow in two sockeye populations: one from an inlet stream (genetically programmed to migrate downstream) and one from a lake, which had been established 13 generations previously by salmon from an inlet stream. Using laboratory raceways, the two researchers found that both groups migrated downstream. Surprisingly, though, fry from the lake showed a greater tendency to migrate downstream than the inlet population did. Presumably, this result reflects genetic drift. Or it may be that natural selection indeed operated—but for an entirely different trait that was by happenstance linked to the gene controlling downstream migration. In any event, this study shows that salmon may possess an array of traits that do not necessarily reflect the selective pressures of their local environment. Yet even if the majority of these traits do reflect local adaptations, the long-term persistence of salmon will not be hampered by the loss of some genetic diversity if the fish can evolve rapidly enough. Just how quickly can a new trait arise? By again examining these same two populations of sockeye, Hendry, in a paper published last year, suggested that reproductive isolation and evolutionary divergence can happen in as little as 13 generations. Specifically, among sockeye, the size of the male body is sexually selected (females almost always mate with the larger males) and reaches a maximum among beach-spawning populations, because shallow water limits the size of stream-spawning males. After only 13 generations, males of beach-spawning sockeye had significantly larger bodies than males from the parent stream-spawning population—these lake dwellers had evolved to reflect their new environment in just decades. These findings remain controversial, but regardless of whether they prove to be in error, Hendry and coworkers have raised the specter that the conservation of a wide spectrum of observable traits is not necessarily of paramount concern—a somewhat surprising outcome. How then should resource managers charged with saving salmon respond? Uncertainty about the importance of local adaptation at small spatial scales, about the rate of adaptive evolution or simply about the value of diversity could be used to justify a continuation of research rather than action to preserve salmonid populations now. That would be unfortunate: Too much remains unknown about the importance of biodiversity to discount it at present. So we favor a precautionary approach. That is, people should consider the consequences of being wrong about their assumptions. If biodiversity proves less important than anticipated, so be it. But if biodiversity turns out to be more critical than is now believed, we want to ensure that salmon will not have been sent down the path to extinction without the genetic resources to escape. Conservation biologists have generally argued that biodiversity is valuable for two reasons. First, it leads to a greater abundance of the species in question, because different populations can exploit different habitats and resources in unique ways. Second, it fosters enhanced long-term stability by spreading the risk and providing redundancy in the face of unpredictable catastrophes. Both arguments apply well to salmon—and strongly support the precautionary approach to conserving their biodiversity. The many salmon ESUs utilize their freshwater habitats in very distinct ways: For example, some sockeye spawn in lakes, others in rivers. And salmon often spawn and migrate at different times and to different parts of the ocean. Furthermore, genetic diversity offers insurance against the vagaries of climatic fluctuations that can affect salmon populations dramatically. Fisheries scientists know why salmon populations are on the brink—the complex network of dams, the failure to regulate the salmon harvest adequately, the destruction of salmon habitat and an over-reliance on hatcheries have all contributed to varying degrees. Saving Pacific salmon will clearly require immediate action that will include economic sacrifice, societal discipline and a commitment to a science-based recovery strategy—all at a very significant cost to the people of the affected regions. But people must acknowledge that there is no clear line between sustainability and extinction for salmon, because their populations change so much over time and space. The current quest for a precise definition of how much habitat salmon need, how many can be safely harvested, or how little biological diversity needs to preserved is not consistent with the needs of the species. For millennia the salmon have “hedged their bets” against major catastrophes, such as ice ages, continental uplifts and volcanic eruptions. They have done so by maintaining a diversity of populations and habitats—in short, they have developed a rich and varied set of genes. Salmon should be allowed to continue pursuing their survival strategy—a strategy that worked before humans arrived on the continent and, if these fish manage to survive, will work long after we are gone. The authors thank Michael Ford, Robin Waples, John Williams and Peter Kareiva for their aid with this article. Adkison, M. D. 1995. Population differentiation in Pacific salmon: Local adaptation, genetic drift, or the environment. Canadian Journal of Fisheries and Aquatic Sciences 52:2762–2777. Caro, T. M., and M. K. Laurenson. 1994. Ecological and genetic factors in conservation: A cautionary tale. Science 263:485–486. Gould, S. J., and R. C. Lewontin. 1979. The spandrels of San Marco and the Panglossian paradigm: A critique of the adaptationist programme. Proceedings of the Royal Society of London B 205:581–598. Hendry, A. P., J. K. Wenburg, P. Bentzen, E. C. Volk and T. P. Quinn. 2000. Rapid evolution of reproductive isolation in the wild: Evidence from introduced salmon. Science 290:516–518. Hensleigh, J. W., and A. P. Hendry. 1998. Rheotactic response of fry from beach-spawning populations of sockeye salmon: Evolution after selection is relaxed. Canadian Journal of Fisheries and Aquatic Sciences 76:2186–2193. Hilborn, R., J. Maguire, A. M. Parma and A. A. Rosenberg. 2001. The precautionary approach and risk management: Can they increase the probability of successes in fishery management? Canadian Journal of Fisheries and Aquatic Sciences 58:99–107. Labelle, M., C. J. Walters and B. Riddell. 1997. Ocean survival and exploitation of coho salmon (Oncorhynchus kisutch) stocks from the east coast of Vancouver Island, British Columbia. Canadian Journal of Fisheries and Aquatic Sciences 54:1433–1449. Leider, S. A. 1989. Increasing straying by adult steelhead trout, Salmo gairdneri, following the 1980 eruption of Mount St. Helens. Environmental Biology of Fishes 24:219–229. Lichatowich, J. 1999. Salmon Without Rivers: A History of the Pacific Salmon Crisis. Washington, D.C.: Island Press. National Research Council. 1996. Upstream: Salmon and Society in the Pacific Northwest. Washington, D.C.: National Academy Press. Quinn, T. P. 1993. A review of homing and straying of wild and hatchery-produced salmon. Fisheries Research 18:29–44. Reisenbichler, R. R., and S. P. Rubin. 1999. Genetic changes from artificial propagation of Pacific salmon affect the productivity and viability of supplemented populations. ICES Journal of Marine Science 56:459–466. Waples, R. S. 1991. Pacific Salmon, Oncorhynchus spp., and the definition of “species” under the Endangered Species Act. Marine Fisheries Review. 53:11–20. Phillip S. Levin is a biologist with the National Marine Fisheries Service. He received his doctorate in zoology from the University of New Hampshire in 1993 and was a postdoctoral fellow at the Institute of Marine Science, part of the University of North Carolina. Levin has studied fishes of coral reefs, kelp forests and estuaries. His current research focuses on the ecology and conservation of Pacific salmon. Michael H. Schiewe received his Ph.D. in 1980 from the University of Washington in Seattle, and he is now the director of salmon science at the Northwest Fisheries Science Center, part of the National Marine Fisheries Service. Schiewe’s research has focused primarily on the impact of human-caused environmental alterations on salmon health and survival. Address for Levin: National Marine Fisheries Service,2725 Montlake Boulevard East, , Seattle, WA 98112-2097.